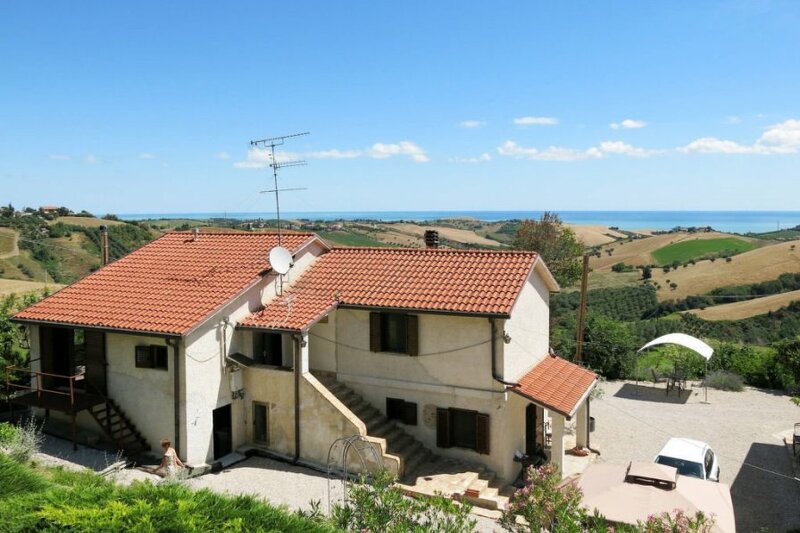 This 1 bedroom villa with swimming pool is located in Roseto degli Abruzzi and sleeps 4 people. It has WiFi and barbeque facilities. The villa is near a beach. Apartment, 2 - 4 people, 2 room/s, 1 bedroom/s, 1 bathroom/s, approximately 65 m², 1 floor/s, apartment on ground floor, restored 2018, separate access to the property. Caretaker lives in separate studio. Feature: Property on a manor (2 building(s) in total, 4 units in total). Furnishing: good, pleasant, tasteful, with some antique furnishings, tiled floor, laminate floor. Equipment: satellite TV; internet access Wi-Fi (included). Access/parking: gravel road, approximately 100 m.
Estate (shared use with the caretaker): approximately 2000 m² (whole estate 5 ha) , open plot, in a hillside, terraced, natural surroundings, meadow, gravel, fields, fruit trees, olive trees. Garden maintenance by the caretaker 2 time/s per week. Outdoor facilities(private use): reserved open space (pavilion), reserved open space (pavilion), terrace (pavilion), further terrace (pavilion), furnishing provided, brick barbecue. Pool (private use): 10.0 x 5.0 m, 1.30 m deep, 04/05/19-05/10/19, frame swimming pool. Pool area: lawn for sunbathing, wood terrace, deck chairs. Wellness: private use (free of charge): whirlpool. Sale of own produce (depending on availability, fruit, vegetables). The agent describes this villa as an ideal holiday rental for the summer holidays. It is also good value for money. The villa has a swimming pool and is located in Roseto degli Abruzzi. The nearest airport is only 42km away. It is set in a good location, 6km away from a beach and 8km away from the city center. The villa has free wireless internet. The villa is adequately equipped: it has a dishwasher and a washing machine. It also has a BBQ.